Combine beer, garlic, and shallots to create the marinade. Coat the lamb shanks and allow them to marinate in a covered container overnight (12 hours). Place lamb shanks, onion, carrot, and potatoes in a roasting pan with 1 ½ cups of the marinade. Cook for 2 ½ hours covered at 325 degrees. Using a fork, pull lamb off bone after cooling for 10 minutes. Remove lamb and vegetables and transfer the pan drippings to a sauce pot. To create mint au jus, add mint leaves to the drippings, bring to a boil, then simmer on medium-high heat for 5-10 minutes. 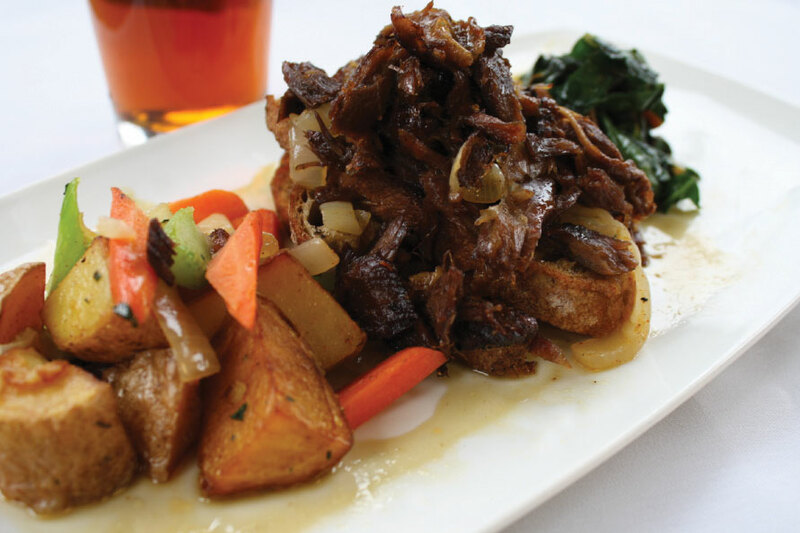 Serve lamb shanks, vegetables, and mint au jus over sliced bread. Serves 4.